You can embed a URL into a form or report which, when clicked in the Preview window or (more usefully) on a pdf of the form, will take you to a designated web site or create a new email in the recipient’s email program. The properties window for the element will open. which links to a (hypothetical) payment site and populates the invoice_num and amount fields on the payment page with the invoice number (ourref) and amount (gross) from the MoneyWorks invoice transaction. 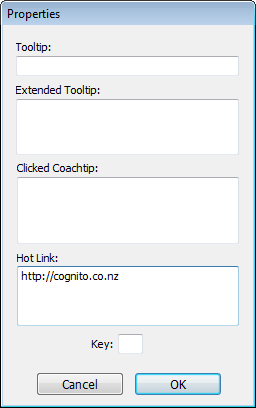 Hot links are used extensively in the MoneyWorks Navigator (see next section), the layout of which was done entirely in the Forms Designer (and hence can be customised if desired). Tip: If your hotlink formula gets too long, split it into components by calculating sections of it in invisible calculation fields, e.g.